When I first got into bodybuilding and fitness, I weighed 120 pounds, skinny, scrawny, and weak. Quite honestly, I was mocked for even entertaining the idea that I could lift! I didn't have a strong support system. No one believed that I could do it—even I had my doubts. My self-esteem was extremely low, but I knew I wanted to succeed. I was determined to get big, make gains, and prove to myself that I could go from scrawny to brawny. Overcoming the mental barriers is just as difficult as overcoming the physical ones. It's difficult to believe in yourself, to change, to get out of the box you've been stuck in, and it's difficult to admit your weaknesses. However, overcoming challenges in your life helps you to grow as a person and increases your confidence. Once you're confident, you can face whatever comes your way. I know what it's like to feel confused, intimidated, and hopeless. But you can put on muscle! You just need the right application of knowledge. Here is the simple template I used to overcome the cynics, trump the odds, transform my life and body, and put on more than 60 pounds of mass. Yes, you want to find what drives and motivates you to be your best, but the inner strength I'm talking about is your core. Too many people neglect this part of the body—but it's so important. If you strengthen your core first, you'll be able to handle a greater load when you move on to heavier weight training. You'll also ensure your ability to train safer, endure longer, and ultimately make greater gains. When I say think big, I'm talking about the muscles you train. Emphasize your legs, back, chest, and shoulders! These are large muscles, and if they grow, so will your appearance! 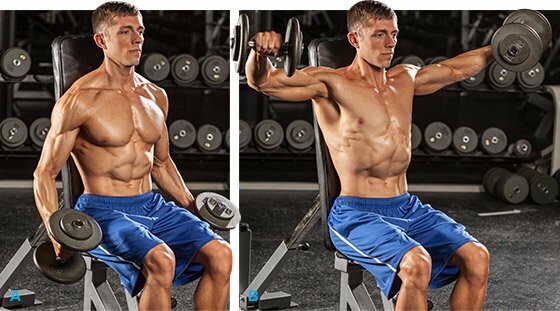 To build these muscles most effectively, do basic compound movements. Oh, don't worry, compound movements will also recruit and work your smaller, surrounding muscles as well. The big and basic approach will help you train for optimal growth in nearly all the muscles of your body. Sounds ridiculous right? How can you train heavy and hard if you're scrawny? The answer lies in the individual. It's all relative! Maybe your heavy lift is a 55-pound bench press—like mine was when I started. You need to find what is challenging for you and then work with it. It doesn't matter how your number compares with anyone else's. Your goal should be to executive the lifts as safely as possible with enough weight to make each set difficult. As time passes, you will get stronger. That means you should always add weight to your lifts, even if it's only two pounds. You have to consistently push your limits in order to grow. Track your workouts so you know what you lifted and how much you might be able to do next week. Pay attention to your strengths and weaknesses so you can modify your training as improve. Make a schedule, write it down, and stick to it. You're much more likely to stick to your workout routine if you write down what you are going to do and when you are going to do it. Making gains takes time, so make your schedule fit into the life you have right now. If you know you can't spend two hours in the gym, don't plan a two-hour workout. (Actually, don't plan a two-hour workout, regardless.) Make your schedule something you can follow stress-free! To add size, you need time to recover, so your training schedule should include rest days. Your muscles don't grow in the gym—they grow at rest. Although everyone has different rest needs, I suggest all people get two days of rest per week. I hate to discourage people from doing cardio because of the cardiorespiratory benefits, but don't overdo it and risk losing gains! Going from scrawny to brawny requires food and heavy weight; spend too much time on the treadmill, and you run the risk of losing some of that hard-earned muscle. That's right: plateaus can be a good thing. When you hit a plateau, it's a sign that your body has adapted to the stress you placed on it. View this as an opportunity to incorporate change into your routine. If you were training in a rep range of 12 and hit a wall, change it to eight reps and increase the weight. You can also switch exercises, decrease your rest periods, change the tempo of your lifts, or implement dropsets. Any of these variables will shock your muscles and help you grow. Small changes often lead to big differences. Here's a sample of one of my old workout templates. I made sure to train and develop my core muscles before starting this routine. Additionally, I made sure to learn the proper form for all the lifts and practiced the proper movement patterns before increasing the weight. This is just a guideline, so it won't be perfect for everyone. Remember, your body will eventually adapt to the stimulus, so you'll have to make changes to the program. Training is only one piece of the mass-gaining puzzle. You have to eat, rest, and potentially supplement to reach your goals. It's also important to keep a good attitude. Building muscle takes time—be patient!